I was experimenting with the archive mount feature and with the "ease of use" philosophy in mind I felt that the setup of archives could have been smoother. Preferably I would have prefer to just pick the Program File, Setup File, Archive file and let D-Fend figure out the rest. Also the current setup destroys savefiles and such if you whipe the folder, potentially other folders too (like if you have UltraSND). If D-Fend remembered the files the archive added only and kept everything added by a game safe it would be quite nice. By using some kind of "prioritize by date" feature, updated config files and save files could be prioritized. 1. Manually find, download, install and select Archiving program. I decided to use 7z. 2. Manually add ;RAR;ZIP to the "File extensions to handle" field. 4. Set the Program and Setup file "relative to the DOSBox directory". I could in theory just use the game without subfolder, so that things are extracted into the virtual C:. My gutfeeling tells me things would be more compatible if it use subfolders instead. JemyM wrote: I have teamed up with pycur to produce a library for D-Fend Reloaded, making DOS-games as accessible as frontends like MAMEUI (arcadegames), Gamebase 64 (Commodore 64) and FS-UAE (Amiga). 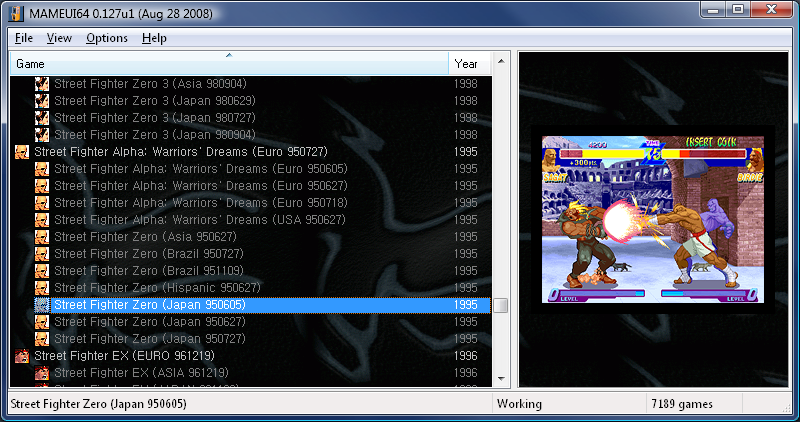 If I'm understanding this correctly; you're modding D-Fend Reloaded to allow for the addition of MAME and other games? So in other words, in addition to being able to add a DOSBox and ScummVM profile, you'll be able to add a MAME profile, among others? SetWorkingDir %A_ScriptDir%\..\..\..\ScummVM (1.10.0) ; Ensures a consistent starting directory. Run, ".\scummvm.exe" "--no-console" "--config=.\scummvm.ini" "monkey-vga"
What I do is add the game to D-Fend Reloaded as a "Windows" game, and choose this compiled AutoHotkey script as the executable. The other executables that this script references do different things. SetWorkingDir %A_ScriptDir%\Sound\FSMP ; Ensures a consistent starting directory. Run, ".\midiplayer.exe" ""-minimized -preset 002""
4x.exe - Scales the game window to 1280x960, or, generally speaking, 4x its native resolution (which for most games, is not supported by ScummVM). 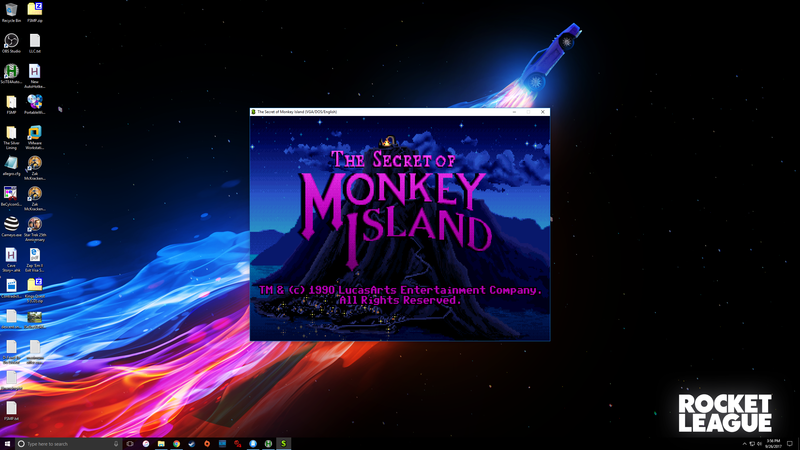 For Monkey Island 3, this acts as a 2x scaler because its native resolution is larger than other games. I want to keep working on mouse lock a bit so that it will continue to run even if the game window loses focus, and re-lock the cursor to the window once more when it receives focus (until the game is closed). I also want to add a function which will lock-unlock the cursor using ctrl+F10 in addition to ctrl+m (to mirror DOSBox functionality). One of the main advantages to launching a game in this way is that it gives you the ability to launch things in order while being able to wait a precise amount of time between commands. This is especially useful to ensure that Falcosoft Midi Player is fully initialized before the game launches. Otherwise, this is just a bunch of quality of life stuff. I'm putting together a portable collection of my favorite games using D-Fend Reloaded and focusing on aesthetics and ease-of-use. As you can see, launching the desired game, fully-configured, is just a double-click away. By the way, my desktop resolution is 2650x1440. 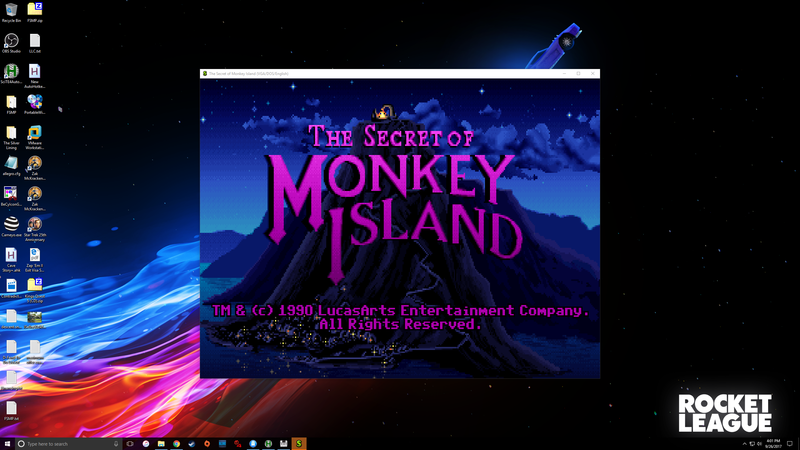 ScummVM natively only scales to 3x, which looks fairly small on my monitor for games like Monkey Island 1 which have a native resolution of 320x240. At 1280x960 (or 4x), the game window is a little more comfortable to view at my desktop resolution. The cool thing is that you can go higher if you want; just have to edit a couple numbers in the AutoHotkey script. thank for the great program!. is it possiable to run it from command line? I don't think it can run zip files. D-Fend Reloaded uses a simple lexical sort on the date column, but allows varying date formats such as year+month+day and just year. In locales where year is not the first component of a date, this often ..results in a useless sort order. D-Fend Reloaded won't run with the lastest version of DOSBox-x (0.82.4). When I change the custom DOSBox installation to that of DOSBox-x in the profile of one of my games, it would crash with the message: E_Exit Can't init SDL No available video device. dor123 wrote: D-Fend Reloaded won't run with the lastest version of DOSBox-x (0.82.4). When I change the custom DOSBox installation to that of DOSBox-x in the profile of one of my games, it would crash with the message: E_Exit Can't init SDL No available video device. D-Fend Reloaded hasn't seen any updates for a while. You may be better off reporting it to the DOSBox-X maintainer(s). I am discussing about this with the DOSBox-X maintainer. See https://github.com/joncampbell123/dosbox-x/issues/641. 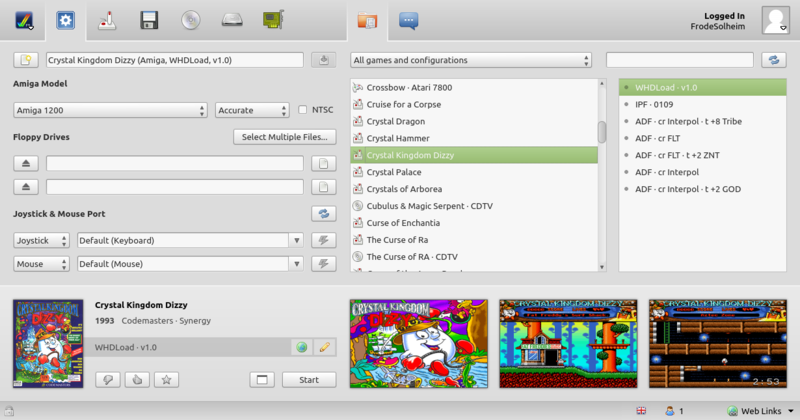 Go to "Program Settings" -> "External programs" -> "DOSBox"
Make sure you are in advanced mode (see the picture below). 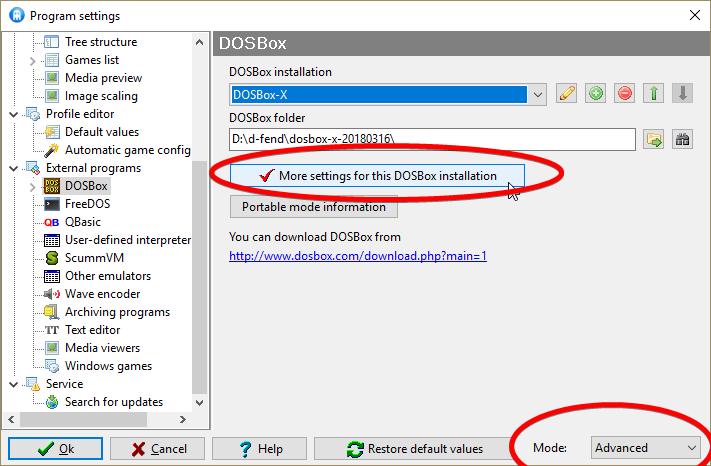 Add DOSBox-X as one of the DOSBox installation (modifying the default is okay). Click "More Settings for this DOSBox installation. (See the picture below. If you don't see this button, then redo step 5). Note: If DOSBox-X doesn't start, you'll be presented a dialog to change settings. DON'T DO THE SETTING TO WINDIB THERE. IT DOESN'T WORK. I produced all steps, and the DOSBox-X stuck into a loop in its initial screen, and don't works. I stresstested D-Fend a bit when I loaded it with 5000 games. It can't handle that many but runs out of memory. lukeman3000 wrote: If I'm understanding this correctly; you're modding D-Fend Reloaded to allow for the addition of MAME and other games? So in other words, in addition to being able to add a DOSBox and ScummVM profile, you'll be able to add a MAME profile, among others? No. What we set out to do was to build preconfigurations and information for every DOS game and the ability to identify them automatically. I am not building a fileset, just information. 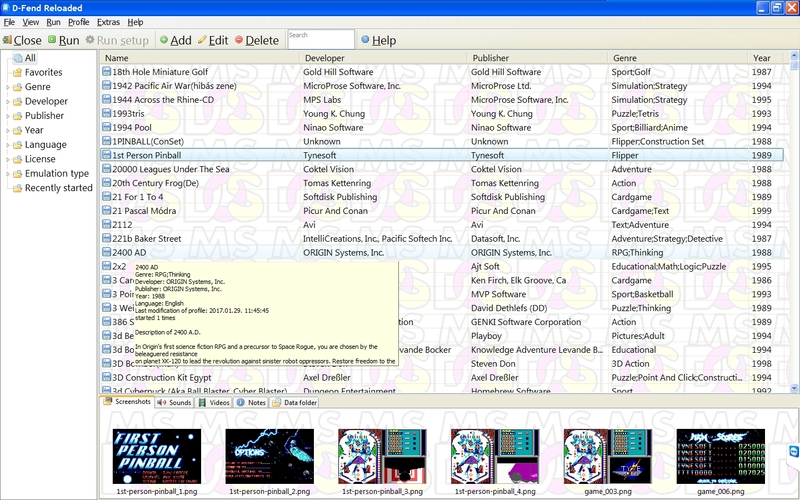 A similar effort have been done for other systems, like MAME, Gamebase 64 and FS-UAE. 6 months later I have taken a huge leap towards achieving this. About 5000 games and a bit over 1000 CD-titles are identified automatically and I am triangulating it with a second database that supports 18000 variants. But D-Fend Reloaded can't handle the database due to memory restrictions that make it crash after a few hundred profiles. Luckily the database is portable, which was my plan from early on. That means that the information is easily converted to other launchers. Perhaps a stupid question, but do I need to keep D-Fend running once I have started a game with it? I mean e.g. Railroad Tycoon Deluxe, started within D-Fend, opens DOXBOS - can I close the D-Fend window at that time and the DOSBOX keeps working? ConjurerDragon wrote: Perhaps a stupid question, but do I need to keep D-Fend running once I have started a game with it? I just did a test to be sure, and DOSBox keeps running when I close D-Fend Reloaded after launching a game via the latter. I downloaded the lastest Dosbox-X 0.82.7, and now this procedure working. But I still can't operate Dosbox-X for each game profile separately in the custom Doxbox installation. Hi! 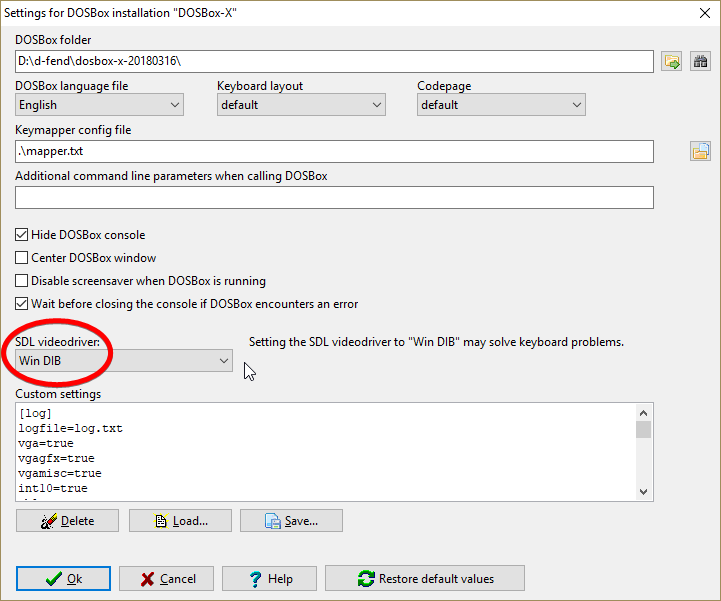 How save the position of window od d-fend main program? it installs but it says that there's no folder, but when i look at it is there, i had to change the directory from games/th2 to tgh2 only, and if i try to run, it crashes. I'm also getting the "Error reading data from www.mobygames.com" message, as well as "Error reading data from thegamesdb.net". TheGamesDB have radically changed their API, while Mobygames has switched to using HTTPS (port 443). I suspect these changes have broken this function in D-Fend (like they did DBGL). You may want to try to contact the D-Fend author or find someone to pick-up maintenance of the application. I've been using DOSBox for a few years now and it works great but am growing tired of either entering command lines or adding them to the end of the config file so I figured the D-Fend Reloaded front end would be a good option to have all my games pre configured and accessable with only a couple of mouse clicks. The problem I'm having is that I can't figure out where everything needs to be placed to load games that need more commands then just simply running a executable. How do I replicate this in D-Fend? Where does each command get entered?